Newfoundland Pony are an “all purpose” pony known for its strength, courage, intelligence, obedience, and willingness. Newfoundland Ponies are hard workers and easy keepers. Newfoundland Ponies’s ancestors first arrived with the Newfoundland’s early settlers from the British Isles. Their ancestors were primarily, Exmoor, Dartmoor, and New Forest ponies and to a lesser extent, Welsh Mountain, Galloway, Highland, and Connemara ponies. They were hardy creatures who were already well adapted to the harsh climate of the islands of the North Atlantic. Isolated from the rest of the world, the ponies intermingled for hundreds of years, breeding in the seclusion of Newfoundland’s bays and coves to produce a sturdy pony uniquely our own. In the past, the Newfoundland Pony ploughed gardens; hauled fishing nets, kelp and wood; gathered hay; and provided their families with transportation around the Island. The center piece of many weddings in fact, was often a pony and a carriage that proudly carried the bride to the church on her wedding day. In the 1970s and ‘80s, the ponies were replaced by tractor power, cars and modern machinery. The darkest part of the Newfoundland Pony’s history was during this period when horse dealers combed the island looking for ponies to ship to mainland slaughter plants. There, they were destined for the dinner tables of France and Belgium. 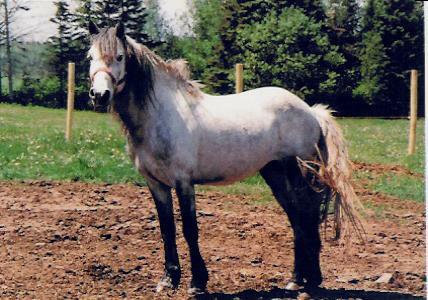 According to records, in 1980 alone, approximately 700 ponies were shipped out of the province to Quebec. To protect this special and historic pony, the Newfoundland Government has recognized it as a Heritage Animal. It is estimated that the current Newfoundland Pony population totals less than 400 animals. An ongoing effort on the part of concerned individuals from across Canada has stabilized the population. However, the Newfoundland Pony continues to be identified as a critically endangered species. Today, the Newfoundland Pony is used for riding, driving and light work. They have an excellent temperament for young people to ride and excel under saddle, and in harness.